Let me not look for allies in life battlefield but to my own strength. Epidemics have taken a great toll of lives in past generations. Death in infancy and early childhood was frequent and there were few families who didn't lose a member of the family at an early age. Medicine has changed greatly in the last decades. Widespread vaccinations have practically eradicated many illnesses, at least in western Europe and the United States. The use of chemotherapy, especially the antibiotics, has contributed to an ever decreasing number of fatalities in infectious diseases. Better child care and education has effected a low morbidity and mortality among children. The many diseases that have taken an impressive toll among the young and middle-aged have been conquered. The number of old people is on the rise, and with this fact come the number of people with malignancies and chronic diseases associated more with old age. Pediatricians have less work with acute and life-threatening situations as they have an ever increasing number of patients with psychosomatic disturbances and adjustment and behavior problems. Physicians have more people in their waiting rooms with emotional problems than they have ever had before, but they also have more elderly patients who not only try to live with their decreased physical abilities and limitations but who also face loneliness and isolation with all its pains and anguish. The majority of these people are not seen by a psychiatrist. Their needs have to be elicited and gratified by other professional people, for instance, chaplains and social workers. It is for them that I am trying to outline the changes that have taken place in the last few decades, changes that are ultimately responsible for the increased fear of death, the rising number of emotional problems, and the greater need for understanding of and coping with the problems of death and dying. When we look back in time and study old cultures and people, we are impressed that death has always been distasteful to man and will probably always be. From a psychiatrist's point of view this is very understandable and can perhaps best be explained by our basic knowledge that, in our unconscious, death is never possible in regard to ourselves. It is inconceivable for our unconscious to imagine an actual ending of our own life here on earth, and if this life of ours has to end, the ending is always attributed to a malicious intervention from the outside by someone else. In simple terms, in our unconscious mind we can only be killed; it is inconceivable to die of a natural cause or of old age. Therefore death in itself is associated with a bad act, a frightening happening, something that in itself calls for retribution and punishment. One is wise to remember these fundamental facts as they are essential in understanding some of the most important, otherwise unintelligible communications of our patients. The second fact that we have to comprehend is that in our unconscious mind we cannot distinguish between a wish and a deed. We are all aware of some of our illogical dreams in which two completely opposite statements can exist side by side -- very acceptable in our dreams but unthinkable and illogical in our wakening state. Just as our unconscious mind cannot differentiate between the wish to kill somebody in anger and the act of having done so, the young child is unable to make this distinction. The child who angrily wishes his mother to drop dead for not having gratified his needs will be traumatized greatly by the actual death of his mother -- even if this event is not linked closely in time with his destructive wishes. He will always take part or the whole blame for the loss of his mother. He will always say to himself -- rarely to others -- "I did it, I am responsible, I was bad, therefore Mommy left me." It is well to remember that the child will react in the same manner if he loses a parent by divorce, separation, or desertion. Death is often seen by a child as an impermanent thing and has therefore little distinction from a divorce in which he may have an opportunity to see a parent again. Many a parent will remember remarks of their children such as, "I will bury my doggy now and next spring when the flowers come up again, he will get up." Maybe it was the same wish that motivated the ancient Egyptians to supply their dead with food and goods to keep them happy and the old American Indians to bury their relatives with their belongings. When we grow older and begin to realize that our omnipotence is really not so omnipotent, that our strongest wishes are not powerful enough to make the impossible possible, the fear that we have contributed to the death of a loved one diminishes -- and with it the guilt. The fear remains diminished, however, only so long as it is not challenged too strongly. Its vestiges can be seen daily in hospital corridors and in people associated with the bereaved. A husband and wife may have been fighting for years, but when the partner dies, the survivor will pull his hair, whine and cry louder and beat his chest in regret, fear and anguish, and will hence fear his own death more than before, still believing in the law of talion -- an eye for an eye, a tooth for a tooth -- "I am responsible for her death, I will have to die a pitiful death in retribution." Maybe this knowledge will help us understand many of the old customs and rituals which have lasted over the centuries and whose purpose is to diminish the anger of the gods or the people as the case may be, thus decreasing the anticipated punishment. I am thinking of the ashes, the torn clothes, the veil, the Klage Weiber of the old days -- they are all means to ask you to take pity on them, the mourners, and are expressions of sorrow, grief, and shame. If someone grieves, beats his chest, tears his hair, or refuses to eat, it is an attempt at self-punishment to avoid or reduce the anticipated punishment for the blame that he takes on the death of a loved one. This grief, shame, and guilt are not very far removed from feelings of anger and rage. The process of grief always includes some qualities of anger. Since none of us likes to admit anger at a deceased person, these emotions are often disguised or repressed and prolong the period of grief or show up in other ways. It is well to remember that it is not up to us to judge such feelings as bad or shameful but to understand their true meaning and origin as something very human. In order to illustrate this I will again use the example of the child -- and the child in us. The five-year-old who loses his mother is both blaming himself for her disappearance and being angry at her for having deserted him and for no longer gratifying his needs. The dead person then turns into something the child loves and wants very much but also hates with equal intensity for this severe deprivation. The ancient Hebrews regarded the body of a dead person as something unclean and not to be touched. The early American Indians talked about the evil spirits and shot arrows in the air to drive the spirits away. Many other cultures have rituals to take care of the "bad" dead person, and they all originate in this feeling of anger which still exists in all of us, though we dislike admitting it. The tradition of the tombstone may originate in this wish to keep the bad spirits deep down in the ground, and the pebbles that many mourners put on the grave are left-over symbols of the same wish. Though we call the firing of guns at military funerals a last salute, it is the same symbolic ritual as the Indian used when he shot his spears and arrows into the skies. I give these examples to emphasize that man has not basically changed. Death is still a fearful, frightening happening, and the fear of death is a universal fear even if we think we have mastered it on many levels. What has changed is our way of coping and dealing with death and dying and our dying patients. Having been raised in a country in Europe where science is not so advanced, where modern techniques have just started to find their way into medicine, and where people still live as they did in this country half a century ago, I may have had an opportunity to study a part of the evolution of mankind in a shorter period. I remember as a child the death of a farmer. He fell from a tree and was not expected to live. He asked simply to die at home, a wish that was granted without questioning. He called his daughters into the bedroom and spoke with each one of them alone for a few minutes. He arranged his affairs quietly, though he was in great pain, and distributed his belongings and his land, none of which was to be split until his wife should follow him in death. He also asked each of his children to share in the work, duties, and tasks that he had carried on until the time of the accident. He asked his friends to visit him once more, to bid good-bye to them. Although I was a small child at the time, he did not exclude me or my siblings. We were allowed to share in the preparations of the family just as we were permitted to grieve with them until he died. When he did die, he was left at home, in his own beloved home which he had built, and among his friends and neighbors who went to take a last look at him where he lay in the midst of flowers in the place he had lived in and loved so much. In that country today there is still no make-believe slumber room, no embalming, no false makeup to pretend sleep. Only the signs of very disfiguring illnesses are covered up with bandages and only infectious cases are removed from the home prior to the burial. Why do I describe such "old-fashioned" customs? I think they are an indication of our acceptance of a fatal outcome, and they help the dying patient as well as his family to accept the loss of a loved one. If a patient is allowed to terminate his life in the familiar and beloved environment, it requires less adjustment for him. His own family knows him well enough to replace a sedative with a glass of his favorite wine; or the smell of a home-cooked soup may give him the appetite to sip a few spoons of fluid which, I think, is still more enjoyable than an infusion. I will not minimize the need for sedatives and infusions and realize full well from my own experience as a country doctor that they are sometimes life-saving and often unavoidable. But I also know that patience and familiar people and foods could replace many a bottle of intravenous fluids given for the simple reason that it fulfills the physiological need without involving too many people and/or individual nursing care. The fact that children are allowed to stay at home where a fatality has stricken and are included in the talk, discussions, and fears gives them the feeling that they are not alone in the grief and gives them the comfort of shared responsibility and shared mourning. It prepares them gradually and helps them view death as part of life, an experience which may help them grow and mature. This is in great contrast to a society in which death is viewed as taboo, discussion of it is regarded as morbid, and children are excluded with the presumption and pretext that it would be "too much" for them. They are then sent off to relatives, often accompanied with some unconvincing lies of "Mother has gone on a long trip" or other unbelievable stories. The child senses that something is wrong, and his distrust in adults will only multiply if other relatives add new variations of the story, avoid his questions or suspicions, shower him with gifts as a meager substitute for a loss he is not permitted to deal with. Sooner or later the child will become aware of the changed family situation and, depending on the age and personality of the child, will have an unresolved grief and regard this incident as a frightening, mysterious, in any case very traumatic experience with untrustworthy grownups, which he has no way to cope with. It is equally unwise to tell a little child who lost her brother that God loved little boys so much that he took little Johnny to heaven. When this little girl grew up to be a woman she never solved her anger at God, which resulted in a psychotic depression when she lost her own little son three decades later. We would think that our great emancipation, our knowledge of science and of man, has given us better ways and means to prepare ourselves and our families for this inevitable happening. Instead the days are gone when a man was allowed to die in peace and dignity in his own home. The more we are making advancements in science, the more we seem to fear and deny the reality of death. How is this possible? We use euphemisms, we make the dead look as if they were asleep, we ship the children off to protect them from the anxiety and turmoil around the house if the patient is fortunate enough to die at home, we don't allow children to visit their dying parents in the hospitals, we have long and controversial discussions about whether patients should be told the truth -- a question that rarely arises when the dying person is tended by the family physician who has known him from delivery to death and who knows the weaknesses and strengths of each member of the family. I think there are many reasons for this flight away from facing death calmly. One of the most important facts is that dying nowadays is more gruesome in many ways, namely, more lonely, mechanical, and dehumanized; at times it is even difficult to determine technically when the time of death has occurred. Dying becomes lonely and impersonal because the patient is often taken out of his familiar environment and rushed to an emergency room. Whoever has been very sick and has required rest and comfort especially may recall his experience of being put on a stretcher and enduring the noise of the ambulance siren and hectic rush until the hospital gates open. Only those who have lived through this may appreciate the discomfort and cold necessity of such transportation which is only the beginning of a long ordeal -- hard to endure when you are well, difficult to express in words when noise, light, pumps, and voices are all too much to put up with. It may well be that we might consider more the patient under the sheets and blankets and perhaps stop our well-meant efficiency and rush in order to hold the patient's hand, to smile, or to listen to a question. I include the trip to the hospital as the first episode in dying, as it is for many. I am putting it exaggeratedly in contrast to the sick man who is left at home -- not to say that lives should not be saved if they can be saved by a hospitalization but to keep the focus on the patient's experience, his needs and his reactions. When a patient is severely ill, he is often treated like a person with no right to an opinion. It is often someone else who makes the decision if and when and where a patient should be hospitalized. It would take so little to remember that the sick person too has feelings, has wishes and opinions, and has -- most important of all -- the right to be heard. Well, our presumed patient has now reached the emergency room. He will be surrounded by busy nurses, orderlies, interns, residents, a lab technician perhaps who will take some blood, an electrocardiogram technician who takes the cardiogram. He may be moved to X-ray and he will overhear opinions of his condition and discussions and questions to members of the family. He slowly but surely is beginning to be treated like a thing. He is no longer a person. Decisions are made often without his opinion. If he tries to rebel he will be sedated and after hours of waiting and wondering whether he has the strength, he will be wheeled into the operating room or intensive treatment unit and become an object of great concern and great financial investment. He may cry for rest, peace, and dignity, but he will get infusions, transfusions, a heart machine, or tracheostomy if necessary. He may want one single person to stop for one single minute so that he can ask one single question -- but he will get a dozen people around the clock, all busily preoccupied with his heart rate, pulse, electrocardiogram or pulmonary functions, his secretions or excretions but not with him as a human being. He may wish to fight it all but it is going to be a useless fight since all this is done in the fight for his life, and if they can save his life they can consider the person afterwards. Those who consider the person first may lose precious time to save his life! At least this seems to be the rationale or justification behind all this -- or is it? Is the reason for this increasingly mechanical, depersonalized approach our own defensiveness? Is this approach our own way to cope with and repress the anxieties that a terminally or critically ill patient evokes in us? Is our concentration on equipment, on blood pressure our desperate attempt to deny the impending death which is so frightening and discomforting to us that we displace all our knowledge onto machines, since they are less close to us than the suffering face of another human being which would remind us once more of our lack of omnipotence, our own limits and failures, and last but not least perhaps our own mortality? Maybe the question has to be raised: Are we becoming less human or more human? Though this book is in no way meant to be judgmental, it is clear that whatever the answer may be, the patient is suffering more -- not physically, perhaps, but emotionally. And his needs have not changed over the centuries, only our ability to gratify them. 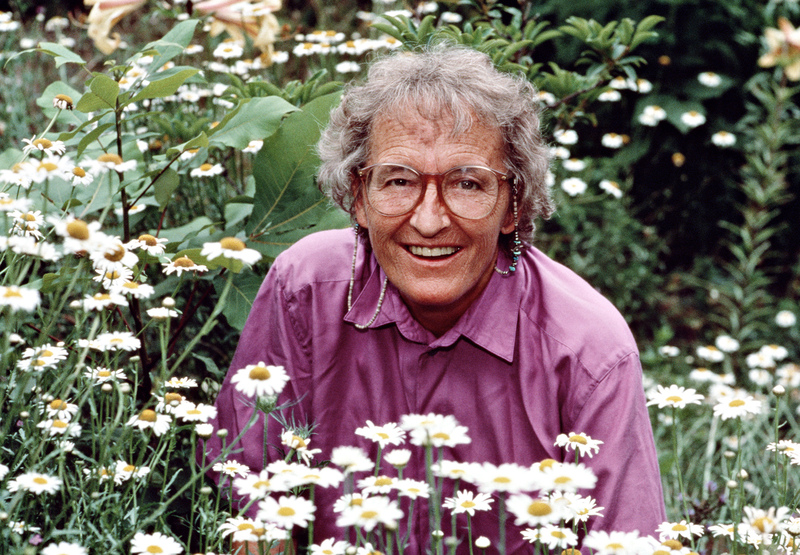 Copyright &copy; 1969 by Elisabeth Kübler-Ross, M.D. 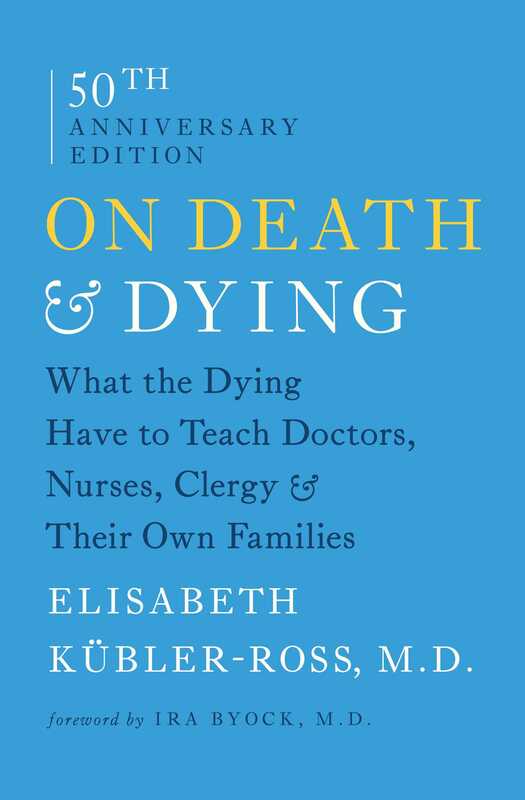 "On Death and Dying can help us face, professionally and personally, the end of life." "A profound lesson for the living." "Seminal... just as important and poignant today as it was 40 years ago."